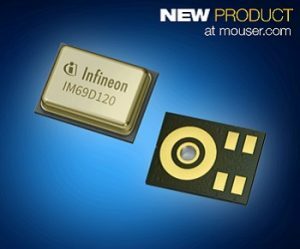 Mouser Electronics, Inc. is now stocking IM69D120 and IM69D130 XENSIV MEMS microphones from Infineon Technologies. The high-performance, low-noise microphones are ideal for applications such as high-quality audio capture, voice user interface, active noise cancellation, or audio pattern detection in monitoring systems. Infineon XENSIV microphones, available from Mouser Electronics, are designed for applications that require low self-noise, wide dynamic range, low distortion and a high acoustic overload point. 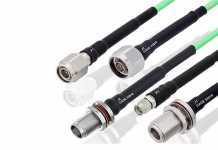 The microphones incorporate Infineon’s dual-backplate microelectromechanical systems (MEMS) technology to enable high linearity of the output signal within a dynamic range of up to 105 dB. The dual-backplate MEMS technology is based on a miniaturized symmetrical microphone design, similar as utilized in studio condenser microphones, which generates a truly differential signal. The technology allows improved high frequency immunity for better audio signal processing and increases the acoustic overload point of 10-percent total harmonic distortion (THD) to 135 dB SPL. The 4 mm × 3 mm microphones feature a noise floor of just 25 dBA (69 dBA signal-to-noise ratio (SNR)), with distortion less than 1 percent, even at sound pressure levels of 128 dB SPL. For design agility, the IM69D120 microphone has been specifically designed to preserve the 69 dBA SNR within the dynamic range of a 16-bit system, whereas the IM69D130 is ideal for 20-bit systems. The SNR is an improvement of 5 dB compared to a conventional MEMS microphone, essentially doubling the possible distance between a user and the device capturing a voice command. Additionally, the microphones’ flat frequency response and tight manufacturing tolerance result in close phase matching of the microphones, benefiting microphone array applications. To learn more, visit mouser.com/infineon.